On the 21st of April, Google introduced the ‘Mobile Usability Update’ to their Google algorithm. 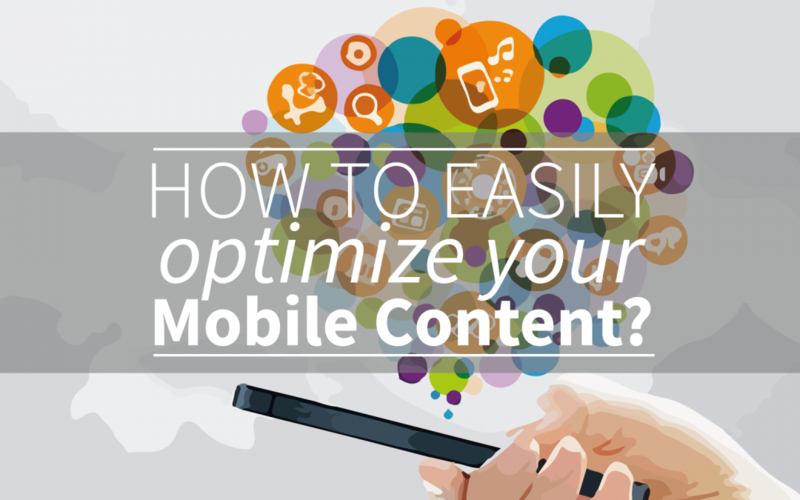 We’ve written a lot about it and today we want to give you our thoughts about ‘how to easily optimize your mobile content’. With 5 simple steps, we’ll learn you how to rock Google Mobile, by fully preparing your mobile content! The update only influences smartphone rankings, no tablet and desktop rankings. If your page gets through the test, it will get a ‘for mobile’-label in the mobile search engine results. The update has an influence on every single URL, not on your website on the higher level; If your website is just partly mobile responsive. There are quite a lot very big sites and companies that don’t pass the test yet so they risk a big part of the traffic on their websites. It’s important that you, as a website owner, respond to these developments. If you want to get the best out of the situation, you should consider making technical changes to your site. But, don’t forget about your content. Mobile websites are visited just as much as normal desktop sites. Relevant mobile content doesn’t necessarily have to be very short, it just has to be clear. Of course you want to get the most out of your mobile site and that’s exactly why it’s very important that you provide good mobile content! If you want to optimize your mobile site, you probably have to make a lot of choices. That’s why you should think about how your organization wants to use the mobile site. What’s the purpose of your site, what do you want to achieve? Is it a channel of service- and information, a new channel for transactions? Do you choose for a independent mobile site or is your mobile site a lengthening of your regular site? You have to think about the goal of the mobile site. Do you want to use your mobile site for sales, experience, blog content or whatever? If you want to have a successful mobile site, you should make your goals clear. If you have a site with 3 or 4 levels of navigation, you probably have a lack of mobile usability. Your mobile website has to be clear and in just one or two clicks, you should have access to all the important information. That’s why you should rearrange your content, make sure that the most important information and subjects get a prioritized position in the mobile site. Think from the perspective of your viewers and your own goals. What do they need to know? That should have your priority! If you write mobile content, it’s very important that you come to-the-point quickly. Although mobile websites get just as much attention as desktop websites, nobody is a fan of unnecessary content. But, don’t let your shorten content affect the quality. That’s still the most important guideline for every character, every word, every sentence you write! This also connects with the step ‘prioritize’, if you prioritize your mobile content, it will be easier to come to-the-point. A good headline can make the difference. Headlines are very important, because the first thing a viewer does on a site is scroll and scan. This headline is the reflection of your content and it makes people decide to click or not to click on a link. A good headline is clear, informative, attractive and provocative. Keep there rules in mind and if you want to know more about how to write good headlines, you can read our article about this subject! It’s very important to have structure in your content. Your viewers should be able to read the important information first and after that the less important information. If you write layered content, your viewers have the chance to deepen into the information that they find important and they can skip the info that isn’t important for them. This makes your usability grow and your site becomes a lot more logical to your viewers. Also the usage of highlights and lists is recommended. This way your content becomes scannable and people can find their information needs as quickly as possible. This is also something you could use webtexttool for, if you want some help to structure your mobile content! If you follow these 5 steps and keep the facts in mind, you’ll be able to make your mobile content en usability grow! Just make sure that you provide your audience what they want, as quickly and easy as possible!